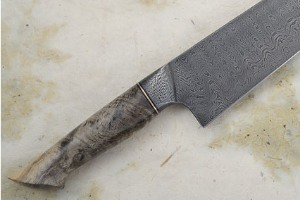 Mareko forged the damascus to have tremendous amounts of detail hidden in the steel. 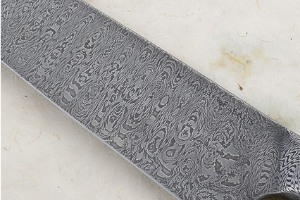 The blade and bolster are all made from one solid piece of damascus. 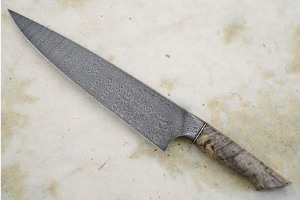 Though integral knives are regularly done in production work, creating an integral bolster in a custom setting is extremely difficult and shows the maker's skill at its best. 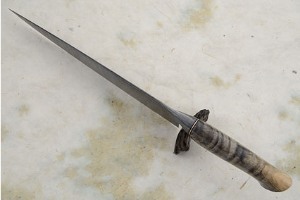 The integral bolster was forged so as to approach the blade at an angle -- resulting in a knife that is amazingly comfortable in a pinch grip. 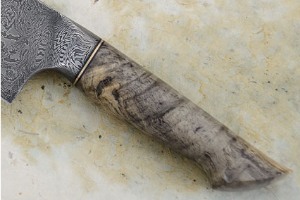 The handle is formed from a single piece of spalted buckeye burl. The workmanship is beautiful, and the wood chosen is gorgeous! Stark contrast between the light and dark aspects is stunning. Contours ensure a comfortable and safe grip. 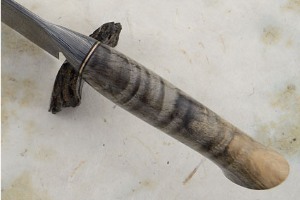 Alternating silicon bronze and black G10 spacers set between the handle and integral bolster assist the wood to adjust to temperature and humidity changes. 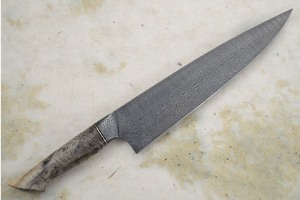 A gorgeous piece built for serious use, yet one of the more dramatic kitchen knives that I have come across!